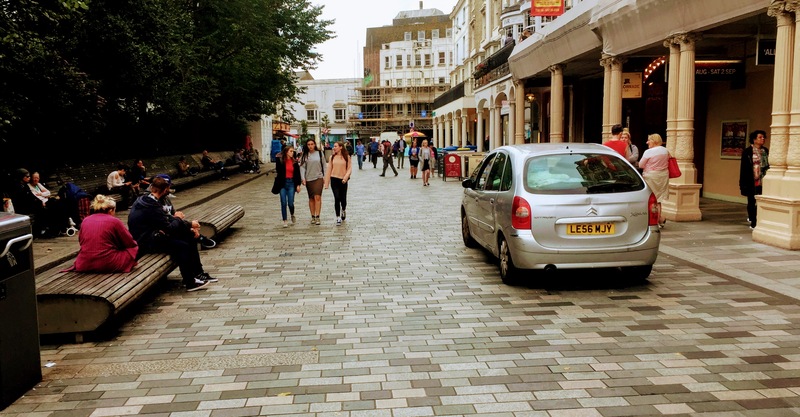 As the idea of “shared space” is receiving more and more attention, it is no surprise that the phrase is being misused more and more as well. Not all rightsizing, and not every traffic calming measure or “road diet” leads to shared space. While important, these efforts generally deal only with traffic—slowing it down or discouraging car use—but they often lack the other key element: place. Shared space is just as much about the people traveling through the area as it is about the people living and working there. And while the concept of shared space fits well into PPS’s philosophy that streets are vital public spaces, professions and practitioners have yet to adopt a unified definition of the term. Let’s take a look closer to the birthplace of shared space, Western Europe, to see if we can land on a useful definition. In the Netherlands, the birthplace of the shared space concept, the definition is more broad. First, the academic traffic engineers at Dutch Institute for Road Safety Research (SWOV) refer to the “creation and design of residential areas,” where “traffic is a guest,” and “the layout should clearly indicate that the primary function of the area is residential.” Here, shared space is not just a traffic scheme, but an entire a design philosophy aimed at creating good residential streets. At PPS and Mobycon, however, we find the definition provided by the Netherlands Knowledge Center to be the most comprehensive and useful. Here, they describe shared space as “a new concept of holistic planning, designing and maintaining public space, in which the design is done is such a way that the interests and the individual responsibility of all users of that space comes first.” This definition emphasizes the social aspects of shared space, and the ways in which the practice works to build a sense of community. Even though each of these definitions emphasizes the importance of de-prioritizing motorized vehicles and removing user priority, it is by focusing not just on the interaction between different types of road users, but also on the people living and working there, that successful shared spaces emerge. 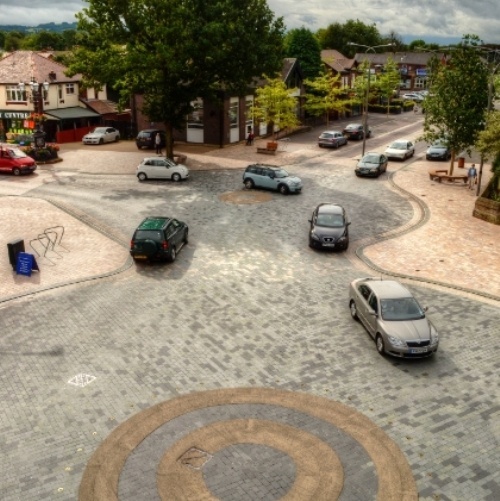 Adopting these ideas often leads to dramatically altered road schemes: A shared space design is typically a low-speed environment that desegregates road users and removes traffic controls such as traffic lights, excessive signage and road markings. 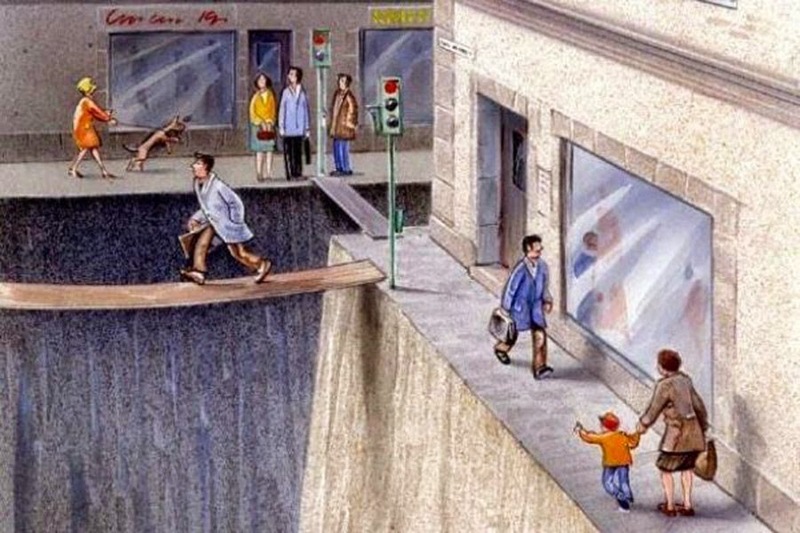 This “humanization” of the road then frees up space for non-traffic functions. While the level of “sharedness” can vary depending on the interaction between modes, in general, shared space fosters civility and interaction between modes, which enables users to move safely through the space using social cues rather than assigning right-of-way to one mode over another. While shared space may seem radical, the concept itself is not new. In many medieval European cities we can still see various remnants of streets acting as places—public spaces that simply work and make us feel good. But even in the New World our streets were for more than just traffic. This video taken along Market Street in San Francisco in 1906 captures a typical early 20th Century Street, a thriving environment with bustling human movement and activity. Travel modes lack a dedicated right of way, and yet passage through Market Street is not only possible, but it is cogent and clear. So what happened over the last century? 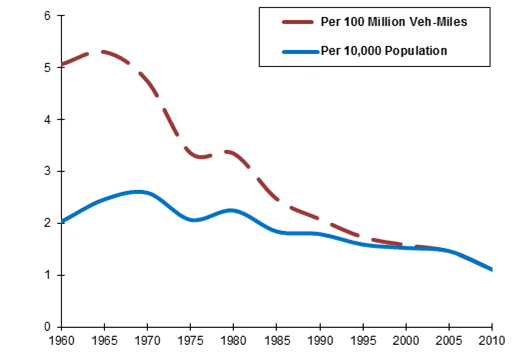 The answer is as simple as it seems unstoppable: the rise of the automobile. Where in the late 19th century streets were still part of a coherent scheme, in the 20th century the (re)design of streetscapes became the responsibility of traffic engineers rather than planners or architects. Following the grand vision of freedom promised by the car, the unrestricted flow of traffic became the standard. With higher speeds and more motorized traffic, then, came increased danger on the road, and the resulting demand for safer infrastructure often took the form of a separation of road users. 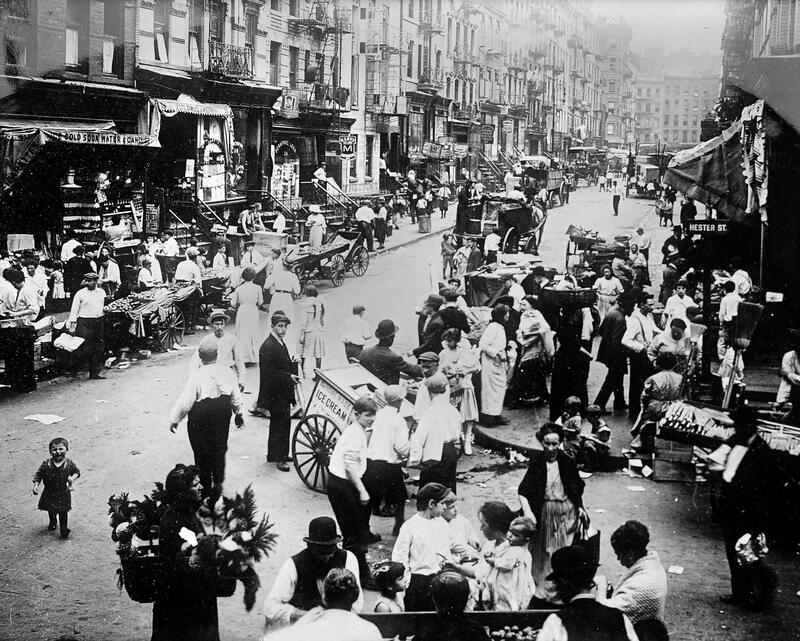 In this image of New York’s Hester Street in the early-20th century, we can already make out the emergence of a sidewalk—pushing pedestrians off the road and onto the edges. Images from only a few decades later show this separation and zoning on a much larger scale. Cobblestones had become concrete or asphalt, while road marking and signs divided the street into through lanes, turning lanes, and parking lanes. Crosswalks highlight where pedestrians are still able to cross the street, effectively banning them from crossing at any other place. Intersections were deemed too complex and were thus regulated with signs and traffic signals. All the while, other functions on the street—shopping, chatting, playing and more—were considered to be unnecessary in these spaces. Some traffic departments even went so far as to actively remove these functions, viewing them to be potential risks in the design: Children should play on a designated playground, surrounded by strong fences, while benches belong in parks. This was a global trend. To be sure, this engineering approach of regulating, separating, and standardizing streets did have several benefits. Ever since traffic safety became a serious focus point in traffic engineering our roads have become much safer. Even taking into account that the amount of miles driven has steadily increased year after year, the reduction in traffic incidents we have seen in every developed country in the world is remarkable. But, as always, this comes at a price. The traffic safety diagram below shows that the rate of decline in fatalities is growing to a stop. And once we consider the enormous amount of infrastructural measures, signs, signals and regulations it took to get to this point, just imagine how much more must be added to our streets and road networks in order to keep the number of fatalities in decline. Hans Monderman, a traffic safety analyst in the Netherlands, spent the majority of his career looking at traffic incidents and always noted the same thing; no matter how much more focus there was on lower speeds, adding signs, building more speed bumps or even implementing traffic signals, these incidents continued. With, or perhaps despite, this life long experience in traffic engineering, in 1995 he came up with a radically new idea: Perhaps less is more on our streets? What if we take traffic measures out rather than adding new ones? What if we went back to the old, instinctual way to moving around—whether by driving, walking or cycling? What made this system work in the first place? Might less guidance by engineering measures lead to more human interaction in traffic wherein individuals pay more attention and both take appropriate measures to be safe? Monderman often quipped, “if you treat people like idiots, they will behave like idiots.” And it’s true: Put in a traffic signal and drivers will only look at the red and green light. But take it away and they will start to notice other road users again, and will start “negotiating” in traffic again. “We’re losing our capacity for socially responsible behavior,” Monderman wrote. “The greater the number of prescriptions, the more people’s sense of personal responsibility dwindles.” This was a radical shift. Instead of going with the traditional way of infrastructural design—top down, regulated, uniform—Monderman experimented with stripping out signage and prescriptive traffic control to force motorist, cyclists and pedestrians to communicate with one another. The results of these interventions were stunning. Not only did traffic slow down and did traffic incidents drop, unexpected side effects appeared. Long lost public space was won and people reclaimed the street. Local shops and bars (re)opened and flourished on a lot of locations. Intersections without traffic lights become possible, and entire villages without a single traffic signs even emerged. Shared space is a tool for holistically retrofitting streets as places. In conventional street design, the functions of movement and mobility often trump the functions of place and access. The massive reallocation and re-purposing of valuable public space has been hugely detrimental of the quality of the public realm, and to the comfort of active transportation. Main streets, market squares and public spaces in communities of all sizes have long been struggling to reconcile the seemingly incompatible demands of increasing traffic forecasts while also maintaining the sense of place, vibrancy, and attractiveness that made them popular destinations in the first place. Surpassing its Dutch origins and going global, the shared space concept can be hugely beneficial to communities experiencing this tension between lost public space and the push from car traffic. In urban environments, where the context of the space is more important that the system of moving vehicles, shared space desegregates the users of the space, and removes the “right to the road” from the automobile. This creates a public space where cars are guests, not masters, of the public realm. As Fred Kent always says, "If you plan for cars and traffic, you get cars and traffic. But if you plan for people and places, you get people and places." For over 40 years, PPS has been helping communities and local governments to re-imagine their streets as vibrant, human scale places. For this resource, and for our future shared space projects, we have partnered with Mobycon, a Dutch-Canadian consultancy group headquartered in Delft, the Netherlands, who have over 30 years experience working on shared space projects across Europe, including collaborations with the late Shared Space pioneer Hans Monderman. Together, we offer design concept guidance to help communities work with transportation and planning agencies to apply shared space concepts on their streets. For more information, please contact the PPS transportation team or the Mobycon design team.